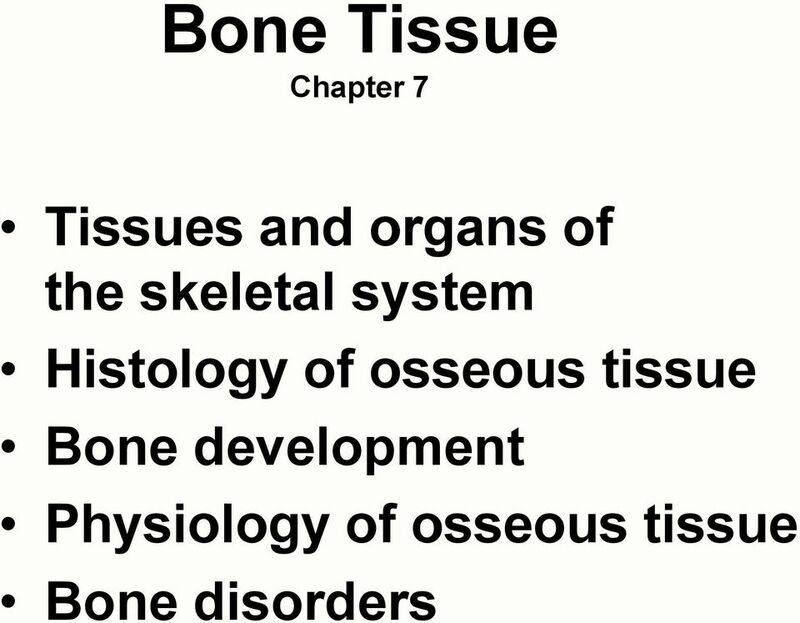 Download "Bone Tissue Chapter 7"
3 Compact Bone and Spongy Bone Compact Bone does not have any spaces or hollows in the bone matrix that are visible to the eye. 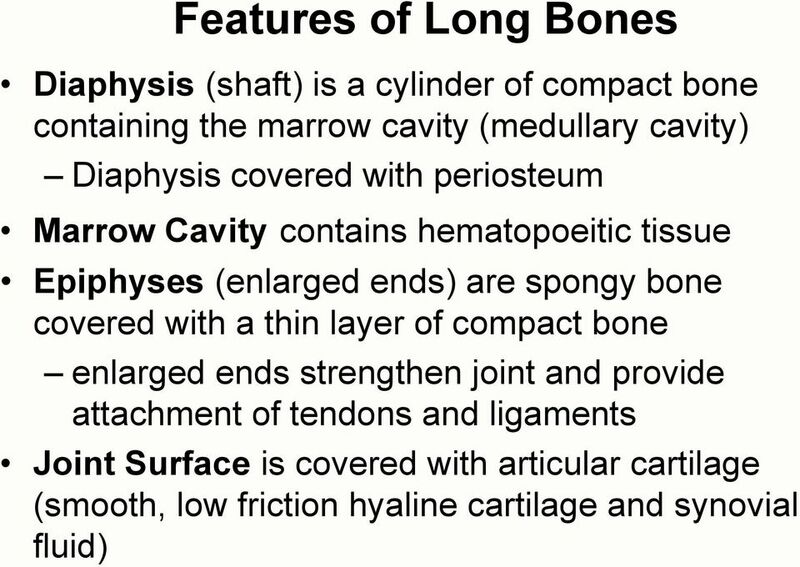 Compact bone forms the thick-walled tube of the shaft (or diaphysis) of long bones, which surrounds the marrow cavity (or medullary cavity). A thin layer of compact bone also covers the epiphyses of long bones. 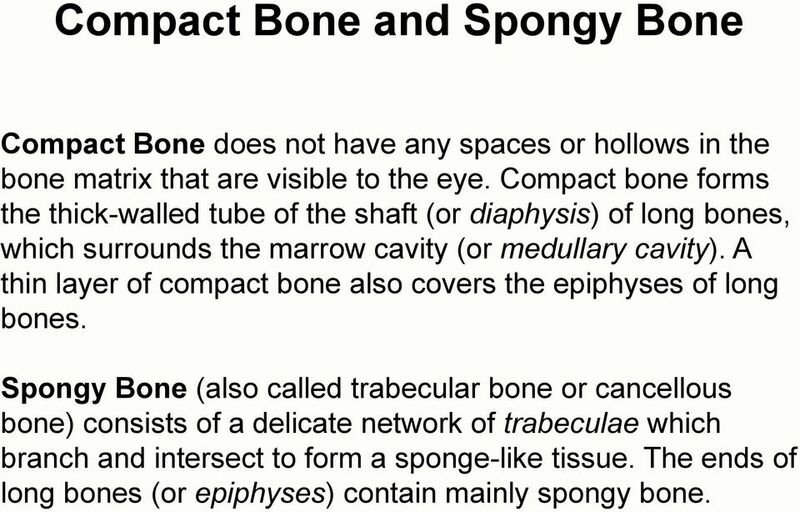 Spongy Bone (also called trabecular bone or cancellous bone) consists of a delicate network of trabeculae which branch and intersect to form a sponge-like tissue. 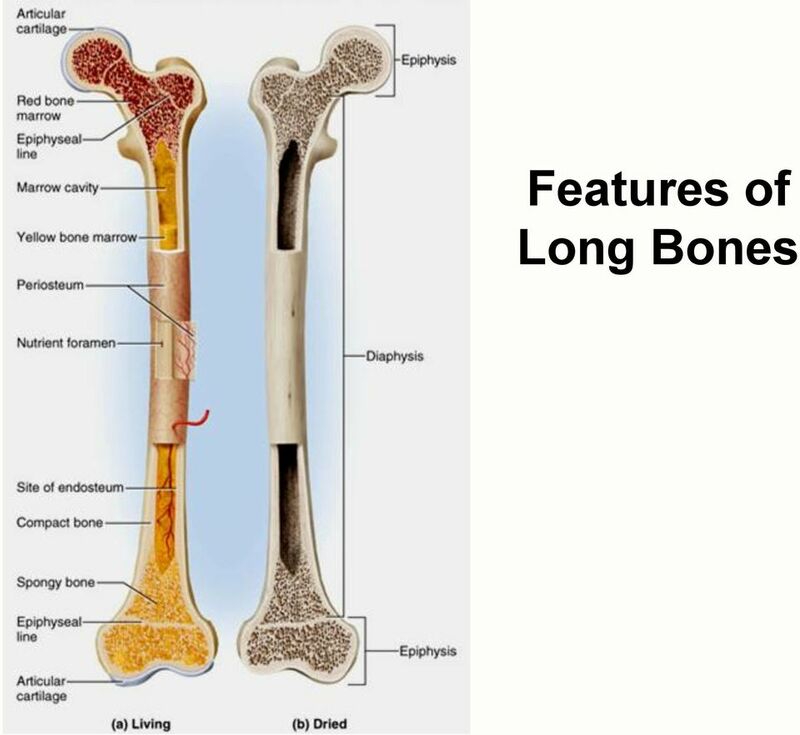 The ends of long bones (or epiphyses) contain mainly spongy bone. 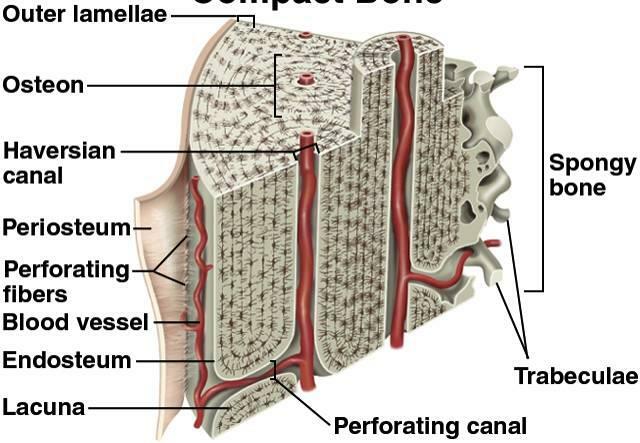 8 Structure of a Flat Bone External and internal surfaces of flat bone are composed of compact bone. 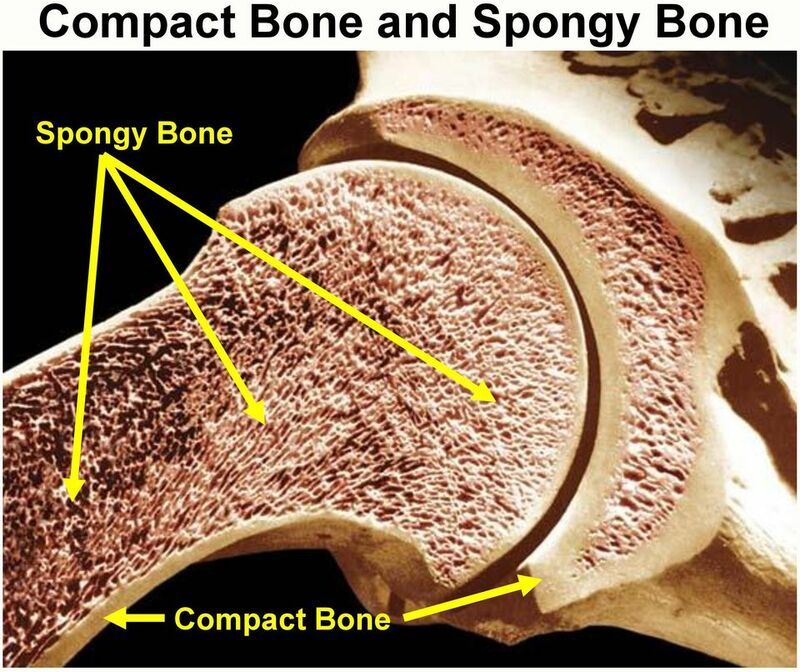 Middle layer is spongy bone and it is also called the diploe. 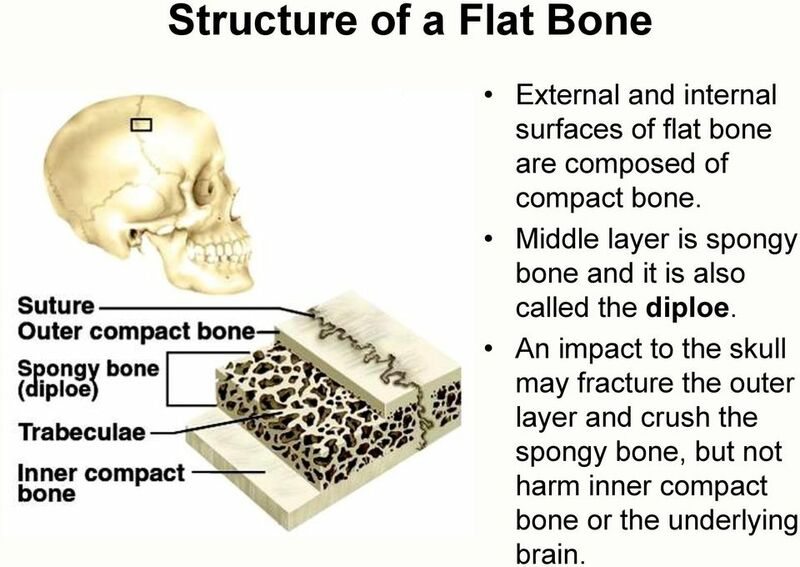 An impact to the skull may fracture the outer layer and crush the spongy bone, but not harm inner compact bone or the underlying brain. 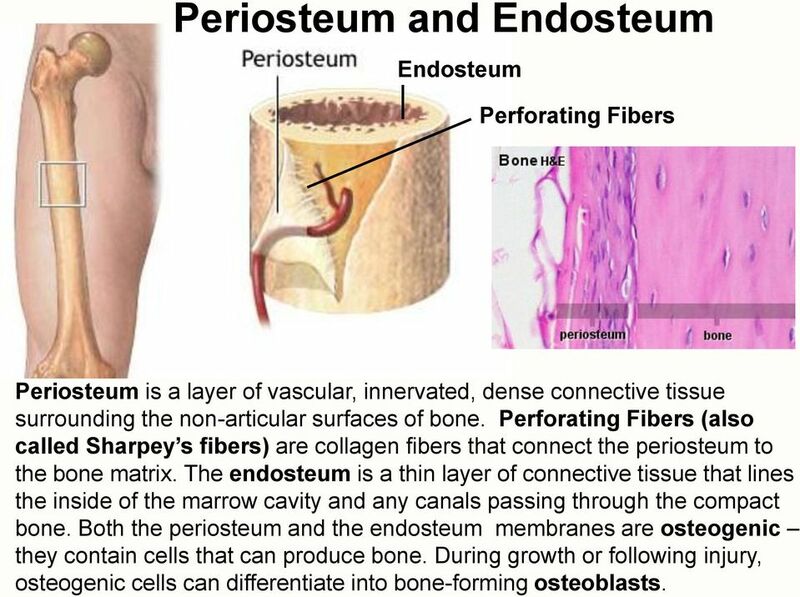 9 Osteogenic Cells Osteogenic Cells are found in the endosteum and periosteum. 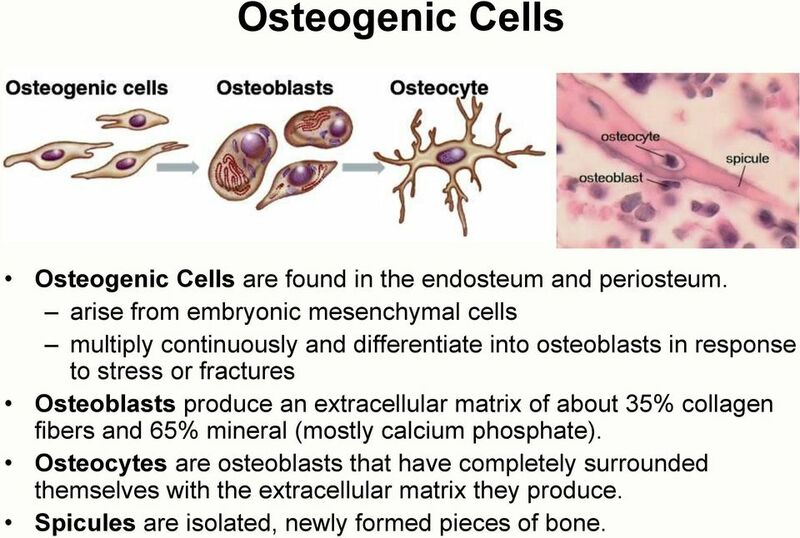 arise from embryonic mesenchymal cells multiply continuously and differentiate into osteoblasts in response to stress or fractures Osteoblasts produce an extracellular matrix of about 35% collagen fibers and 65% mineral (mostly calcium phosphate). 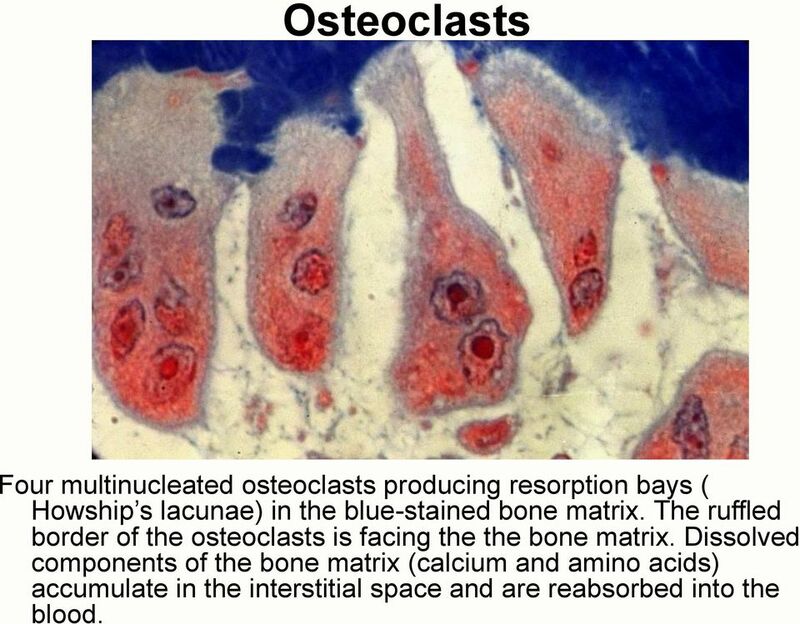 Osteocytes are osteoblasts that have completely surrounded themselves with the extracellular matrix they produce. Spicules are isolated, newly formed pieces of bone. 10 Osteocytes Osteocytes are completely surrounded by bone matrix. Lacunae are the pits in the matrix occupied by the cells. 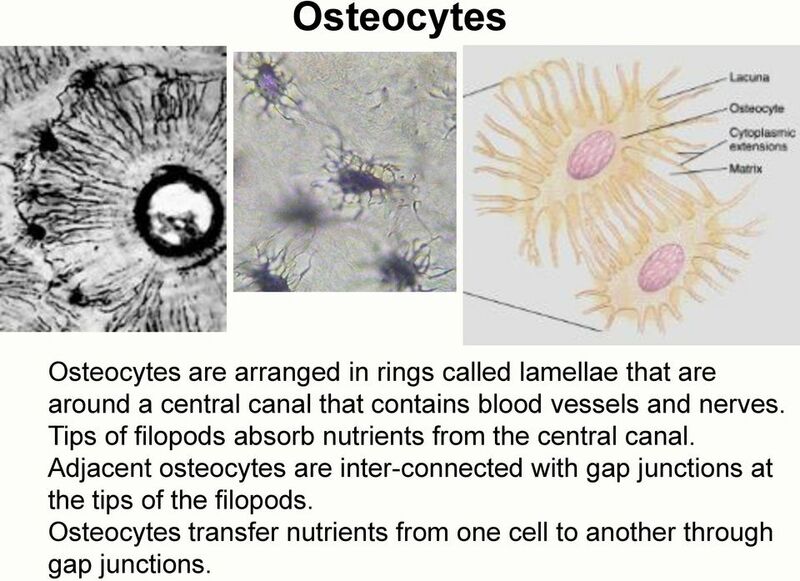 Filopods (also called pseudopods, cytoplasmic extensions, dendritic processes) are long thin extensions of the osteocytes that produce bone matrix around the cell. Filopods are inside tiny canals in the matrix called canaliculi. 11 Osteocytes Osteocytes are arranged in rings called lamellae that are around a central canal that contains blood vessels and nerves. Tips of filopods absorb nutrients from the central canal. Adjacent osteocytes are inter-connected with gap junctions at the tips of the filopods. Osteocytes transfer nutrients from one cell to another through gap junctions. 12 Osteoclasts Macrophages Some stem cells in bone marrow develop into macrophages white blood cells called macrophages. Some macrophages leave the blood and move into bone tissue. In the bone, 3-50 of these macrophages can merge into giant, multinucleated cells called osteoclasts. A single cell formed by the fusion of several cells is called a syncitium. 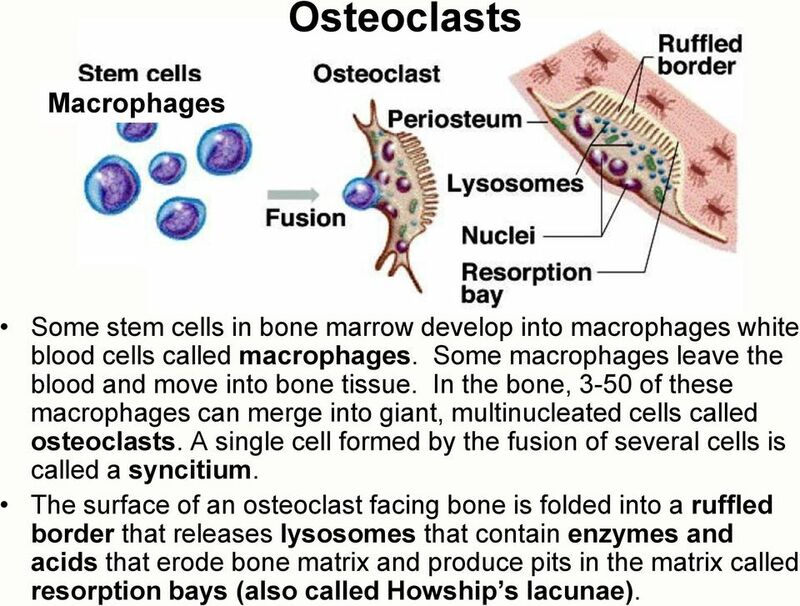 The surface of an osteoclast facing bone is folded into a ruffled border that releases lysosomes that contain enzymes and acids that erode bone matrix and produce pits in the matrix called resorption bays (also called Howship s lacunae). 13 Osteoclasts Four multinucleated osteoclasts producing resorption bays ( Howship s lacunae) in the blue-stained bone matrix. 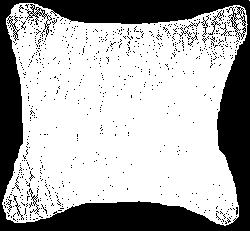 The ruffled border of the osteoclasts is facing the the bone matrix. 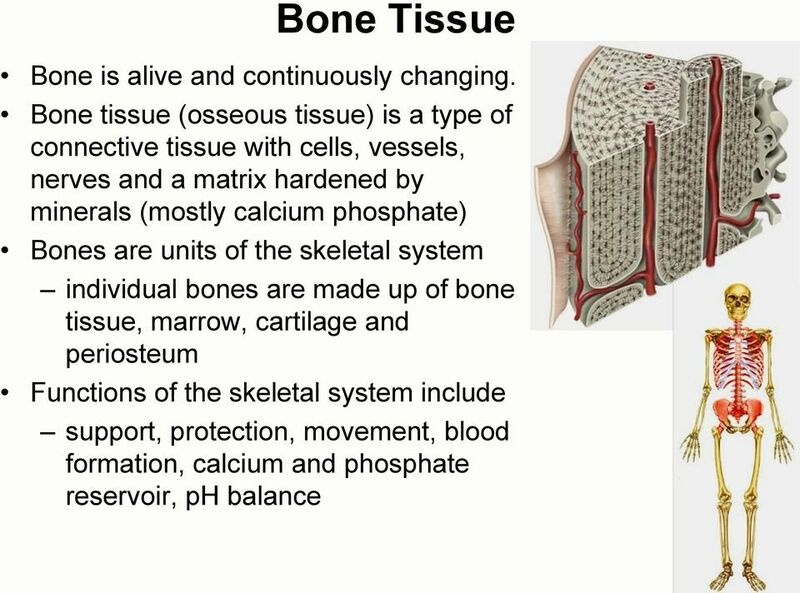 Dissolved components of the bone matrix (calcium and amino acids) accumulate in the interstitial space and are reabsorbed into the blood. 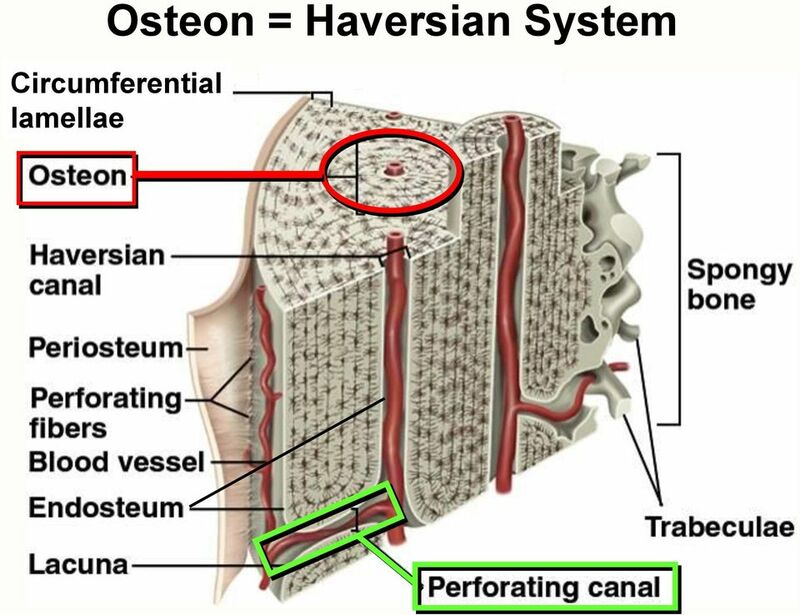 16 Compact Bone Osteon (Haversian system) is the basic structural unit of bone. 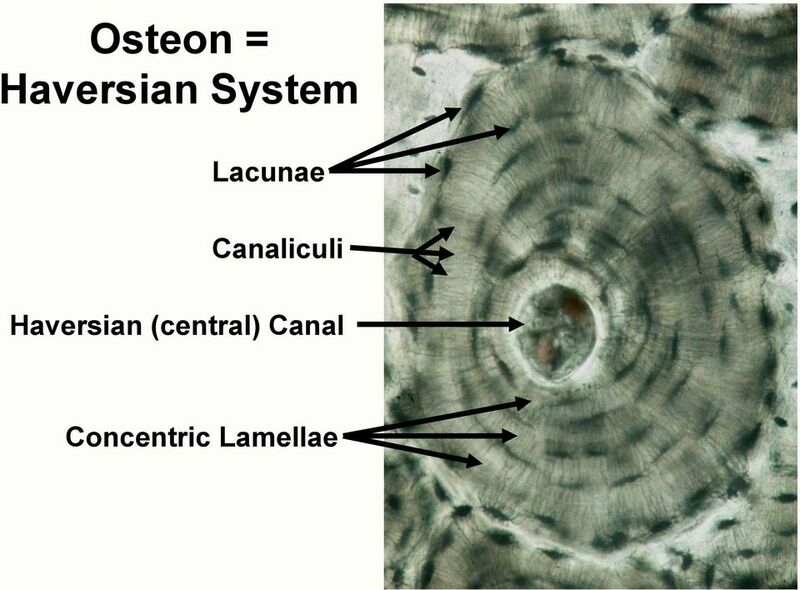 Osteons are cylinders of bone tissue formed from layers (concentric lamellae) of osteocytes and matrix arranged around a central (Haversian) canal. Central Canal is lined with endosteum and contains a neurovascular bundle. Neurovascular Bundles contain an artery, vein, nerve and lymphatic vessel Osteocytes are connected to each other and their blood supply by thin pseudopods within canaliculi. 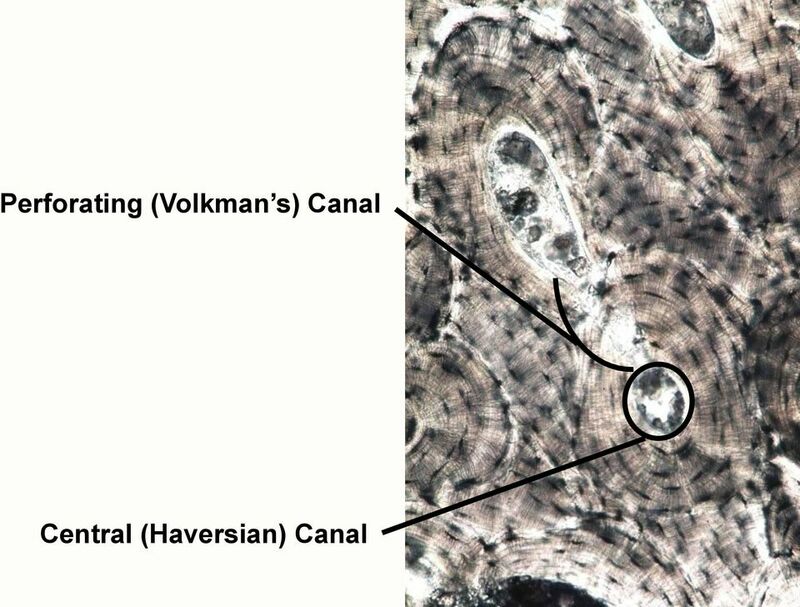 Perforating Canals (Volkmann s canals) are perpendicular branches of the central (Haversian) canal Circumferential lamellae ring the outer circumference and the marrow cavity. 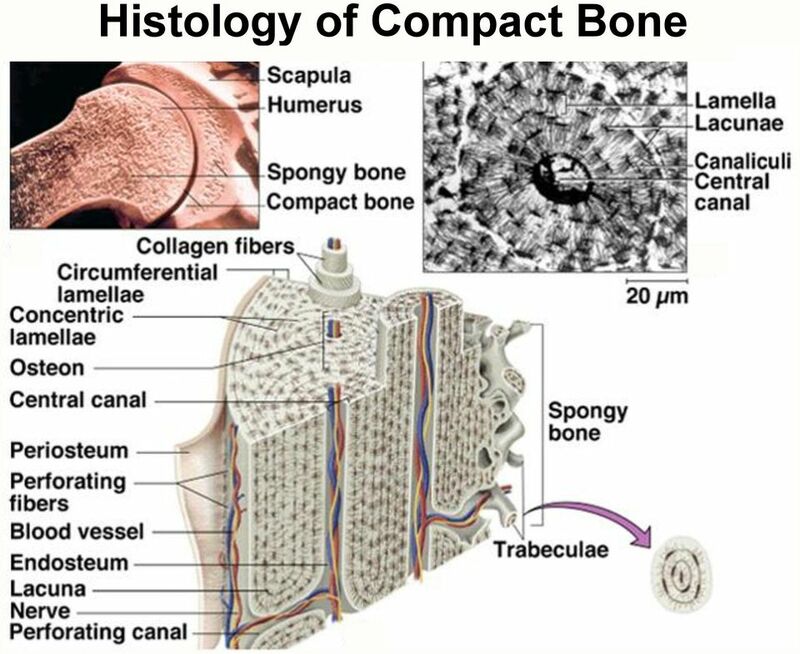 Bony trabeculae branch off the compact bone surrounding the marrow cavity, filling the cavity with spongy bone. 25 Two types of Bone Development Intramembranous Ossification produces the flat bones of the skull. Endochondral Ossification produces most of the other bones of the skeleton including the long bones of the extremities (arms and legs). The principal difference between intramembranous bone formation and endochondral bone formation is what is replaced during development. The tissue replaced during development in intramembranous ossification is embryonic CT. The tissue replaced in endrochondral ossification is hyaline cartilage. The two processes can occur side by side, and do, in the case of fracture healing and in the development of the the mandible and the clavicle which develop partially from intramembranous ossification and partially from endochondral ossification. 29 Intramembranous Ossification periosteum bone periosteum This is a cross section of fetal skull bone developing by intramembranous ossification. The irregularly shaped pink areas are developing spicules of bone. 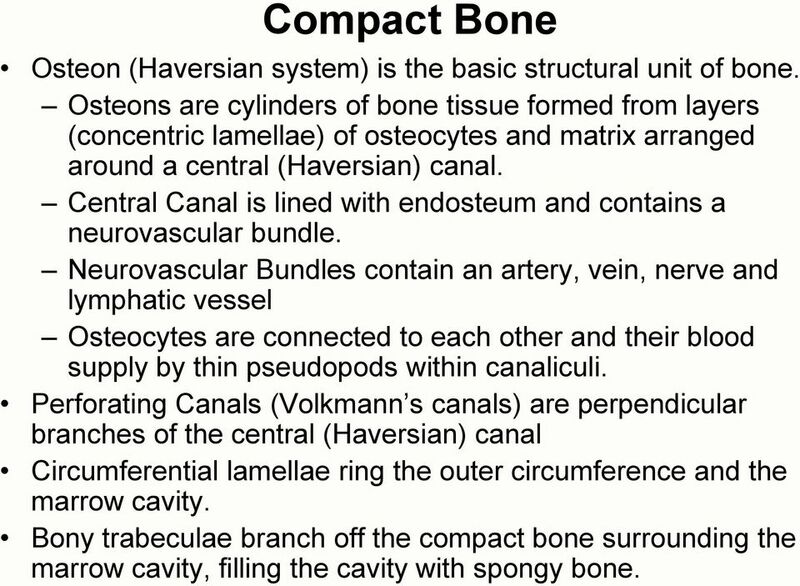 30 Intramembranous Ossification Ob HC Oc T ECT T Ocl T HC Embryonic connective tissue (ECT) is gradually replaced by trabeculae (T) of bone that developes around blood vessels in Haversian canals (HC). 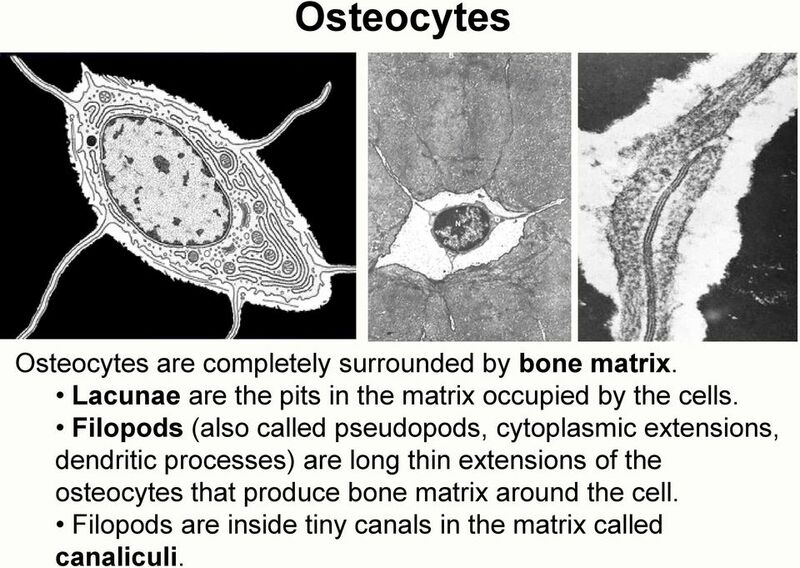 Osteoblasts (Ob) cover the developing trabecular bone (T) and become osteocytes (Oc) once completely surrounded by matrix. Multinucleated osteoclasts (Ocl) demineralize and remodel the bone matrix. 32 Ossification Centers The primary ossification center forms as cartilage in the center of the cartilage model becomes hypertrophic from a growing blood supply. Hypertrophic cartilage calcifies and dies. Osteoclasts remove of the dead hypertrophic cartilage and then blood vessels, nerves and osteoblasts grow into that space. The same process begins in each epiphysis forming secondary ossification centers that will develop into spongy bone. 35 Zones of Ossification E Cartilage proliferates, becomes hypertrophic, calcifies, dies and is removed and is replaced with new bone tissue. 37 Secondary Ossification Centers develop in the Epiphyses Secondary Ossification Center Diaphysis Metaphysis Epiphysis Epiphyseal plate Metaphysis is cartilaginous tissue between the primary and secondary ossification centers. The epiphyseal plate (growth plate) is a temporary layer of cartilaginous tissue between the spongy bone of the medullary cavity (marrow cavity) and the spongy bone in the epiphyses that persists until growth of the bone is complete. 38 Secondary Ossification Centers Secondary ossification centers begin to form in the epiphyses near time of birth. 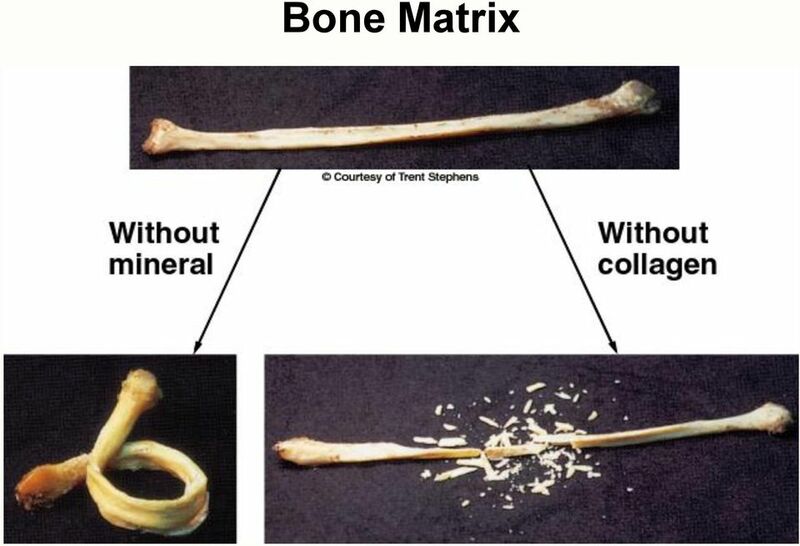 Bone development does not proceed all the way to the end of the bone. Hyaline cartilage remains over epiphysis as the articular cartilage of the joint surface. The metaphysis is at the junction of the diaphysis and epiphysis and forms an epiphyseal plate (also called a growth plate) until growth ends. 40 The Fetal Skeleton at 12 Weeks stained red for bone tissue. Cartilage is unstained. 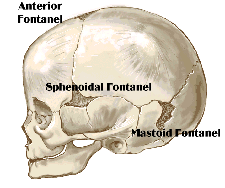 41 Cranial ossification is incomplete at birth Soft regions of the skull called fontanels are regions of dense irregular connective tissue. There are usually 6 fontanels at birth Most fontanels close by 12 months and all are usually closed by 24 months. 45 Achondroplastic Dwarfism Achondroplastic dwarfism is a genetic disorder resulting in short stature but normal-sized head and trunk Long bones of the limbs stop growing in childhood but other bones are unaffected. 47 Gigantism Robert Pershing Wadlow in 1938, at age 20 with actresses Maureen O Sullivan, left, and Ann Morris. Smithsonian August 2005 p. 76. 48 Robert Pershing Wadlow, with his mother at his side, had grown to a record height of 8 11 by the time of his death at age 22. 49 7 pounds at age 2 There are over 200 different types of dwarfism, all of which involve bone growth disorders (osteodysplasia) that result in short stature (adult height less than 4 ft. 10 in. tall). Primordial Dwarfism is a group of disorders in which growth is proportional but severely delayed, beginning in the womb. This results in some of the smallest people in the world. The individual pictured has Majewski osteodysplastic primordial dwarfism (MOPD) Type II. Only about 100 individuals worldwide have been identified as having MOPD type II. Both males and females of all ethnic backgrounds are affected. Some families have more than one child with MOPD Type II, which suggests that the disorder is inherited in an autosomal recessive manner. Majewski osteodysplastic primordial dwarfism type II (MOPD II): Natural History and Clinical Findings. Hall, Flora, Scott, Pauli, Tanaka, Am J. Med Genet A Sep 15 ; 130A(1):55-72. 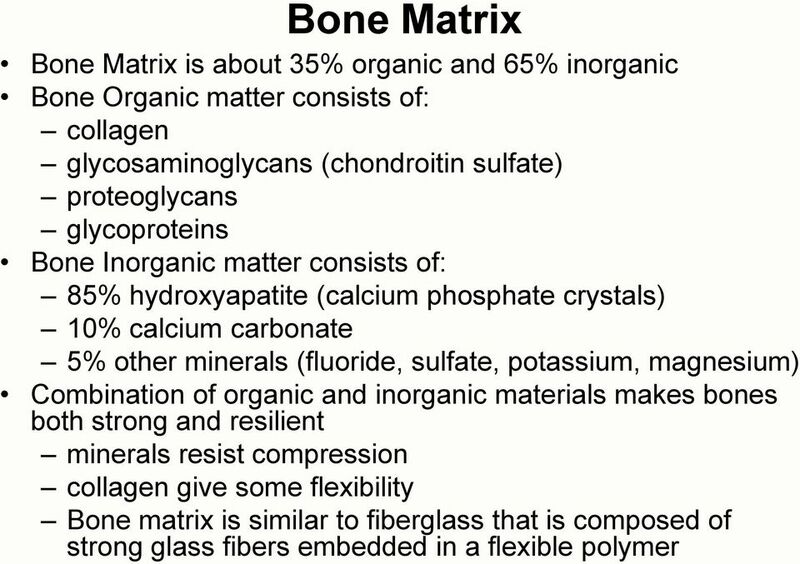 50 Mineralization of Bone Matrix Mineralization is a process in which ions (mostly calcium and phosphate) are removed from blood plasma and are deposited in the matrix of bone tissue. Steps of the mineralization process: osteoblasts produce collagen fibers fibers become encrusted with minerals Image taken using a Scanning Electron Microscope showing collagen fibers produced by osteoblast cells on a polyurethane foam scaffold mimicking the bone matrix production and mineralization processes. 58 Osteoporosis Most common bone disease Bones lose mass and become brittle due to loss of both organic matrix and minerals increases risk of fracture of hip, wrist and vertebral column hump results from deformed spine Best treatment is prevention: exercise and a recommended calcium intake of 1000 mg/day between ages 25 and 40.